FreebiesDock is simply a collection of completely free design resources. 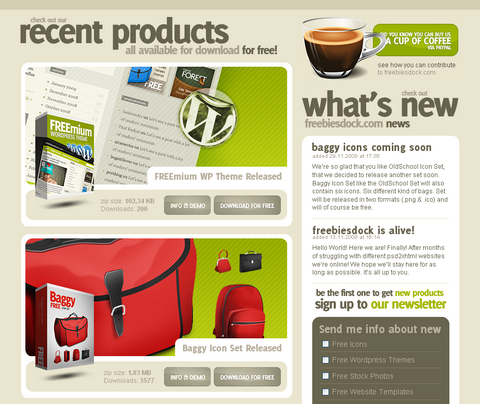 All the products you’ll see there were created exclusively for FreebiesDock and you won’t see them anywhere else. There are hundreds of “free downloads” websites, but most of them provide poor quality services. Paul Kadysz is the proud founder of FreebiesDock who wants it to be different. It provides some quality free downloads includes WordPress themes, Website templates, Royalty free icon sets, Royalty free stock photos and Design related articles. For the moment i see a pair of free icon sets, and a wordpress theme. If they’re exclusive for that website, that’s good. I like the layout and if it will get more content, i’ll add it to my freebies collection.